Melanie Cole and Vicky DeRouchey, founders and co-owners of ugowear, embody the mission of their company. “Our mission is to inspire you to live the life you want, in and out of the water, without fear. We dare you to be free!” Cole and DeRouchey not only built a company based on this mission, but they also live life with this courage. Their story reveals their perseverance and determination, as they dare to be free! Cole and DeRouchey have shared the past 27 years building their relationship through friendship, careers, and most recently, marriage. Before the inspiration of the ugowear brand, DeRouchey and Cole worked for a family-owned software engineering company. While they both enjoyed their jobs in sales and consulting, they no longer wanted to build other people’s dreams. Instead, they dreamed of making their own impact in the world. After DeRouchey successfully battled two rounds of breast cancer, the couple no longer took for granted the joys of life. At age 50 and 60, Cole and DeRouchey realized that it was time to make a significant life adjustment. Cole and DeRouchey experience the passion and joy of life during outdoor adventures. Travel, boating, and water play are what they love to do. By letting go of fear, and daring to be free, the couple received the inspiration for ugowear. In fact, Cole shares her experience of waking in the middle of the night and jotting down the first notes about the product. She recalls her initial thoughts. While enjoying the water sports they love, DeRouchey and Cole experienced the struggle to keep their valuables safe and secure. They wished for a slim, stylish, waterproof bag during long hikes on the beach. The vision of ugowear waterproof bag was the solution for a common problem people living an outdoor, active life experience. The journey began in 2013 with an initial cash investment for design drawings. From that moment forward, they were led to enthusiastic professionals who believed in their product and mission. Through generous gifts of time and talent, these experts helped them move through design to company branding to product prototype phases more efficiently than other entrepreneurs. After a successful Kickstarter campaign (raising more than double their initial request), the dream of the ugowear waterproof dry bag became a reality. The couple is grateful for all the incredible guidance and support they received. However, Cole and DeRouchey did experience challenges, which the partners transformed into learning experiences at every turn. They were not shy about asking for help when they needed it. Cole recalls some key lessons she learned along the way. 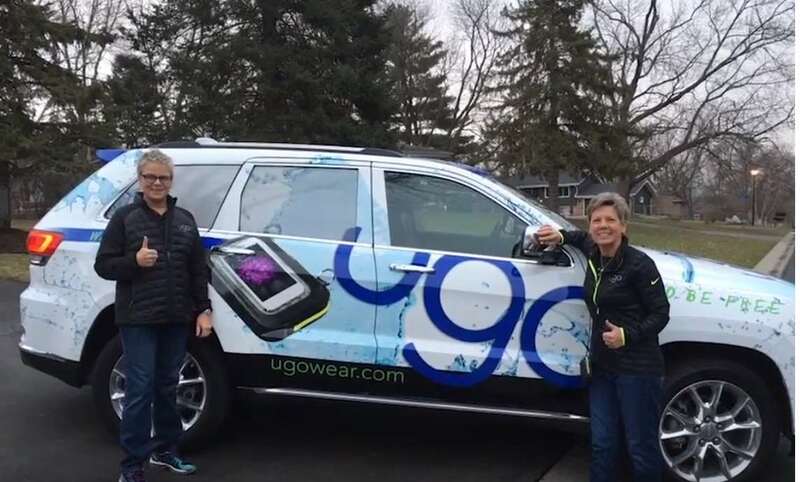 From customer video reviews to professional water sports ambassadors, the ugowear.com website engages with people who love the outdoors and who love their ugowear dry bags. Adventure seekers worldwide want the highest performance technology to protect their valuables. This community has seen plenty of product failures on the market. They are ready to invest in a 100% waterproof bag with a clear plastic, responsive touch sleeve. The ugowear bag allows for full use of electronic devices without ever removing them from the dry bag protection. The ugowear bag was extensively redesigned as it moved through the prototype process. Cole and DeRouchey spent months researching fabric and zipper technology. While they recognized they were creating something new, they had no idea how challenging it would be to find the right materials and technology. Every prototype went through rigorous testing with many failed attempts. The final ugowear bag boasts a third party, IP68 Certified Waterproof rating. This rating ensures the product is entirely waterproof under pressure and while submerged up to five meters. Since the product inception in November of 2015, thousands of ugowear bags have found their way to outdoor adventurers. ugowear cases have received 100% positive reviews, and not a single bag has failed in the field. Enthusiastic, worry-free customers share their praises of the ugowear waterproof dry bag. While customers praise ugowear’s performance, the outdoor adventure industry has given awards and recognition for these fashionable waterproof bags. ugowear received the Best New Product award at the Annapolis Boat Show and made The Family Handyman Must Have list. Sea Tow approves and recommends ugowear to their boating members. ugowear now has a custom logo line available. Yacht clubs and corporations are ordering this high performance, waterproof case for employee rewards and client gifts. The partners have plans for making an even more significant impact in the world. They envision creating charitable foundations that align with their mission. They look forward to the day when the ugowear company is ready to establish these endeavors. In 2018, Cole and DeRouchey will continue to connect with their enthusiastic customer community. You may see them at an International Boat show, the Surf Expo in Orlando, or the Paddle Sports Retailers in Oklahoma City. They love to see people enjoying life and living worry-free. This is what motivates them to continue to bring the latest innovation in waterproof gear to market. Join their community at ugowear.com and share your adventures. Wherever you go, bring ugo, and dare to live free! Dare to live free and purchase your own ugowear dry bag at ugowear.com.